THE One Piece phenomenon continues with the series’ fourth movie, Adventure of Dead End (or The Adventure of Terminus Death). After the third movie, most fans were not very enthusiastic about the prospects of movie No.4. Fortunately, Adventure of Dead End has tried to break away from the stereotypical and boring animation of its predecessors. The movie begins in a restaurant in an island called Anabaru where the main characters are having their dinner feast. While the captain of the Straw Hat Pirates, Monkey D. Luffy, binges on food, the ship’s navigator, Nami, ponders on how to make more money because they are low on dough (no thanks to Luffy’s eating habits!). Anabaru island does not have much to offer, and without a single casino in sight, the lady has to think of something fast or they will starve before they reach the next island. However, before Nami can come up with a plan, she notices the bartender leading a mysterious man away after the man gives him 100 Berri coins. Nami’s curiosity is naturally aroused (because it involves money) and she asks the bartender about it. After some coaxing, the bartender reveals that there’s a money-making opportunity in an “anything-goes sailing competition”. You guessed it: the gang joins the competition and is pitted against a band of tough opponents. Among them General Gasparde, an unscrupulous former marine official who betrayed his team to become a pirate, and Shuraiya, a persistent bounty hunter who is thirsting to avenge his sister’s death. Every One Piece movie follows the same formula: “Straw Hat” Luffy and his gang stop at a place, meet a big, bad pirate and his victim, whom they end up helping, before leaving for the next destination. This movie is no exception, but it’s still a cut above the other One Piece productions. To begin with, the minor characters are very well-developed – each given equal emphasis. Shuraiya has his own style and his fighting abilities, though not on a par with Luffy’s, are unique and impressive for a minor character. General Gasparde is another noteworthy character. The main stars, however, remain the way they are. Luffy is still an airhead and brilliant fighter. Both Sanji and Zoro are still impressive, especially when they team up while fighting other pirates in the race. Nami continues to be mercenary while Usopp remains a coward, Chopper is as ignorant as ever, and Robin, the calmest and gentlest of the lot. 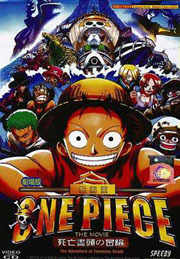 Toei Animation, the company responsible for producing successful series like Dragon Ball and Slam Dunk, gave its best for One Piece: Adventure of Dead End. The animation is fluid, with clever usage of CGI to create the perfect effects. Toei clearly has put in a lot of effort and budget in this anime as the art, particularly the mountains, seas and storms, are breathtakingly beautiful. However, the characters are still lanky and not very proportionate. But if you’re a One Piece fan, you probably won’t complain. The Bahasa Malaysia subtitles are surprisingly good. Conversations are not only translated accurately, they are consistent too. I’m also particularly pleased that they did not choose to translate the characters’ names into Chinese. Evidently, a great effort from the translation team. All said, if you haven’t yet caught this fourth instalment, I’d strongly recommend this exciting, enjoyable and funny show. To those who have not seen the One Piece movies, however, this anime has plot and character designs so bizarre that it’s bound to rub you the wrong way. It is the sort of anime that you either love or hate. n The review copy of ‘One Piece: Adventure of Dead End’ is courtesy of Tower Records Malaysia.